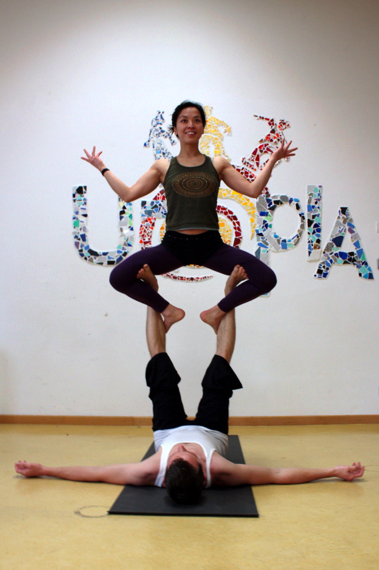 Last year, Tobias Frank and I co instructed acroyoga at Buddhafield. This was only the first of our collaborations and over the festive period Tobias and I joined forces again at the annual Jugglers Festival in Regensburg, Germany. This intimate event is held ever year between Christmas Day and New Year. Over the years, I’ve become more and more entranced with acrobatics and circus skills, and I knew sooner or later I would come head to head with the challenge of juggling. So in some ways you can say this was my juggling judgment day, but what better environment than being surrounded by juggling experts and aficionados to provide inspiration, passion and experience to set my butter fingers to task. The Festival was located at ‘Utopia’; it was to be our place of work, rest and play for the whole duration. Not only was it a privilege to learn under the guidance of masters, but to watch close up such talent at work was a joy. One of the virtuosos at work was Manne Hanke who’s ability is nothing less than art and had me dumbfounded. Watch him in action hereand for more go to his YouTube channel. My attempt at juggling was pitiful and bordered on the comical. After epic fail after epic fail, my sanity and credibility was rescued by a poorly disguised desperate play of showmanship in the form of handstands – executed only to remind my all too frail ego that I can do something of worth. It was good to leave with the aide memoir that practice, practice and practice make perfect. What a great end to 2009 and start to 2010.